Known for their beautiful beaches and dangerous shoals, the Outer Banks of North Carolina are a string of barrier islands that separate and protect seven interconnected sounds from the Atlantic Ocean to form the second largest estuary in the United States. The state has 17 river basins of which 12 empty into the Atlantic and five are part of the Mississippi River Basin emptying into the Gulf of Mexico. Major rivers include the Cape Fear, Chowan, Neuse, Pamlico, Roanoke, Tar, and Yadkin. Three of the state’s largest natural lakes include Lake Mattamuskeet, Lake Phelps, and Lake Waccamaw. Over 9% of the state (5,100 square miles) is covered by water. What is North Carolina’s maritime heritage? North Carolina’s maritime heritage extends back over 4,400 years when Native American people used log canoes for transportation, trade, and fishing. European explorers and colonists ventured to the area in the 1500s but were unsuccessful in establishing permanent settlements until the late 1600s and early 1700s. Until about 1718, piracy in the American colonies was commonplace and the Outer Banks was a haven for pirates, the most notable among them being Edward Teach known as Blackbeard. Although North Carolina saw little fighting during the American Revolution, significant naval action took place during the American Civil War and many ships were sunk by German submarines during World War II. The waters off the Outer Banks are known as the Graveyard of the Atlantic and as Torpedo Junction because of the many hundreds, if not thousands, of ships that have been lost due to the dangerous shoals, storms, and wars. 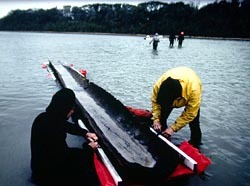 There are more than 5,000 reported shipwrecks in North Carolina waters, the oldest of which include 30 log canoes found in Lake Phelps in 1985. Twenty-three canoes were documented by scientists, 19 were radiocarbon dated with one being almost 4,400 years old, four were removed and treated with preservatives for future study, and two were placed on exhibit at Pettigrew State Park. One unusual shipwreck in state waters is the Queen Anne’s Revenge, the flagship of the pirate Blackbeard and run aground in 1718 near Beaufort Inlet. The remains of a shipwreck presumed to be the Queen Anne’s Revenge were discovered offshore from Fort Macon State Park in 1996. If it is the Queen Anne’s Revenge, it would be one of only two known pirate shipwrecks, the other being the Whydah off Cape Cod in Massachusetts. Under study by a consortium of scientists, recovered artifacts are conserved and transferred to the North Carolina Maritime Museum in Beaufort for storage and exhibit. In 2004, the site was added to the National Register of Historic Places. During the American Civil War, many warships and blockade runners sank in North Carolina waters. The most famous is the ironclad USS Monitor that fought the ironclad CSS Virginia in the Battle of Hampton Roads and sank in 1862 off Cape Hatteras while under tow. Discovered in 1973, the shipwreck was designated the Monitor National Marine Sanctuary in 1975 and a National Historic Landmark in 1986. Artifacts recovered from the shipwreck have been transferred to The Mariners’ Museum in Newport News, Virginia, for conservation, storage and exhibit. Other shipwrecks from this period include 15 blockade runners, one Confederate and four Union military vessels, and one British bark attempting to run a blockade, all of which are in the Cape Fear Civil War Shipwreck District listed on the National Register of Historic Places. During World War II, the German submarines U-85, U-352 and U-701 were sunk off the coast of North Carolina. All popular recreational diving sites and all the property of the German government, the U-85 and U-701 are near Cape Hatteras while U-352 is near Morehead City. The enigma machine from the U-85 was removed and is on loan from the German government for exhibit at the Graveyard of the Atlantic Museum in Hatteras. Who takes care of North Carolina's underwater archeological sites? The North Carolina Department of Cultural Resources is responsible for the state's shipwrecks and underwater archeological artifacts. The Office of State Archaeology in the Division of Historical Resources administers the state’s archeological program and the Underwater Archaeology Branch includes underwater archeologists who oversee the state's submerged cultural resources. You need a permit from the state to explore, recover, or salvage abandoned shipwrecks and underwater archeological artifacts. 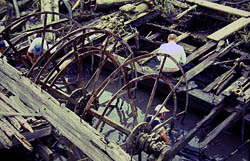 Applicants must have adequate funds, equipment, and facilities to undertake and complete the operation; use accepted techniques of survey, excavation, recovery, recording, preservation, and analysis; and the purpose must further archeological knowledge in the public interest. Applications are sent to the Underwater Archaeology Branch and permits are issued by the Department of Cultural Resources. Are there any underwater parks in North Carolina? In 1991, the state established a program of historic shipwreck preserves to promote preservation of shipwreck sites while also making the sites more accessible to the general public. The shipwreck USS Huron off Nags Head was designated as North Carolina’s first Historic Shipwreck Preserve. What laws concern underwater archeology in North Carolina? State laws about Indian antiquities, archeological resources, unmarked human burials and skeletal remains, and the state’s Archaeological Record Program are codified in the North Carolina General Statutes at NCGS §70-1, et seq. General provisions about the state’s Archives and History Program are at NCGS §121-1, et seq. and laws about salvage of abandoned shipwrecks and other underwater archeological sites are at NCGS §121-22, et seq. Regulations about the state’s Archaeology and Historic Preservation Program are located in the North Carolina Administrative Code at 07 NCAC 04R.0101, et seq. The regulations about exploration, recovery, and salvage of abandoned shipwrecks and other underwater archaeological artifacts begin at 04R.1001, et seq.